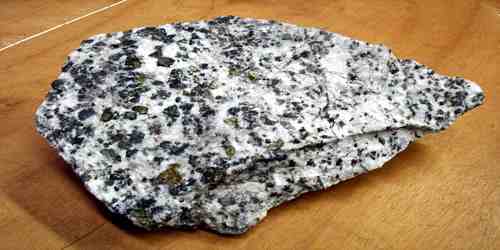 Carbonatite is a carbonate rock of apparent magmatic origin, generally associated with kimberlites and alkalic rocks. It has been variously explained as derived from magmatic melt, solid flow, hydrothermal solution, and gaseous transfer. 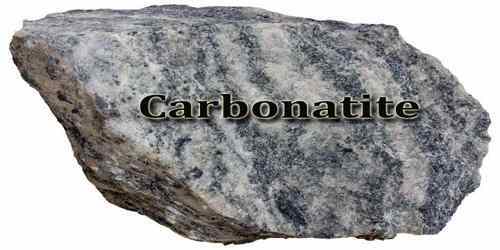 Carbonatites are unusual igneous rocks that contain more than 50% carbonate minerals. There are about 330 known occurrences of carbonatites worldwide (Woolley and Kempe 1989). Most carbonatites are intrusive igneous rocks that occur as volcanic plugs, dykes and cone sheets. Carbonatites usually occur as small plugs within zoned alkalic intrusive complexes, or as dikes, sills, breccias, and veins. They are, almost exclusively, associated with continental rift-related tectonic settings. It seems that there has been a steady increase in the carbonatitic igneous activity through the Earth’s history, from the Archean Eon to the present. They often occur as minor members of larger intrusions of silicate igneous rocks such as nepheline syenite that are commonly referred to as ‘carbonatite complexes’. Most are calcite carbonatites. Carbonatites occur as intruded masses, dykes, and as cone sheets, and rarely as lavas and tephra; and are found in association with alkali-rich igneous rocks, notably those erupted by the volcanoes of the East African Rift. Rare elements, including the REEs (rare earth elements), barium, niobium, thorium, and phosphorus, are often enriched in comparison with many crustal and mantle-derived igneous rocks. Carbonatites are igneous rocks that consist largely of the carbonate minerals calcite and dolomite; they sometimes also contain the rare-earth ore minerals bastnaesite, parisite, and monazite, the niobium ore mineral pyrochlore, and (in the case of the carbonatite deposit at Palabora in South Africa) copper sulfide ore minerals. 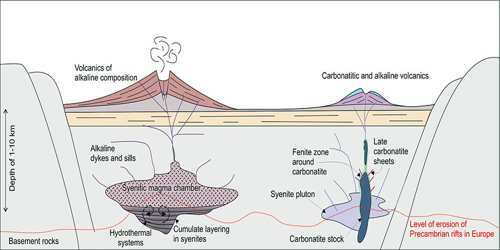 The origin of carbonatite magma is obscure. Most carbonatites occur close to intrusions of alkaline igneous rocks or to the ultramafic igneous rocks with silica contents below approximately 50 percent by weight known as kimberlites and lamproites. 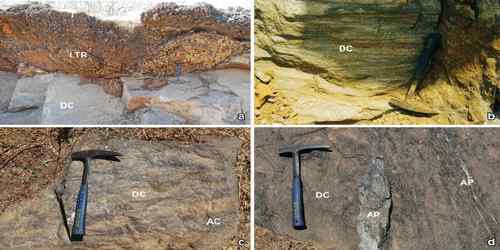 These associations suggest a common derivation, but details of the way that carbonatite magmas might concentrate geochemically scarce metals remain conjectural.